Marker has refined their light-weight touring binding the for the 2012 season - the Marker Tour F12 Alpine Touring Binding now weighs in at 2036 grams (with 110mm brakes) which is just a tad lighter than the tried and true Fritschi Freeride Pros, which have dominated the market for many years. This additional weight savings is always a plus when slogging up the skin track but they also need to be able to perform on the down and be smooth in the transition from ski to skin. 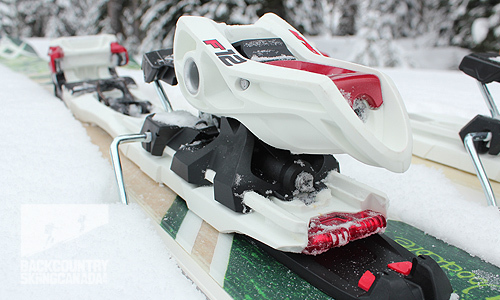 The Marker Tour F12 Alpine Touring Binding has the same basic design as the very popular Marker Duke and Baron bindings only a significantly improved touring weight to performance ratio. Have a read below to better understand how the weight savings was achieved and how they transition from ski to touring mode. So how did they get essentially the Duke binding down almost 2 pounds in weight without sacrificing performance and reliability? Hollow Frame Technology: The frame is fibre-reinforced and gas injected. As well, the heel linkage is also hollow and made from aluminum, as is the strut brace in the toe. This saves again on weight while not compromising torsional stiffness. Finally the climbing aid under the heal is made of titanium and uses as little material as possible while still including an elastomer pad to limit that annoying 'clack' while climbing. Markers heritage of alpine and race bindings proved itself in the Baron and Duke bindings and now in the Marker Tour F12 Alpine Touring Binding. 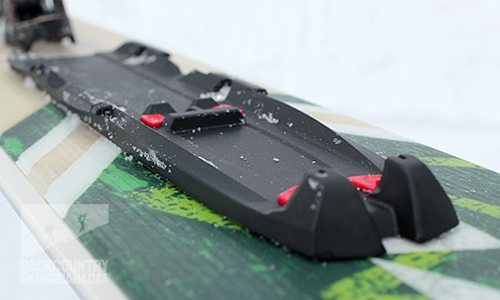 With less weight you would expect less performance, but the power transfer to the ski is easily evident and the stability is unmatched in other AT bindings. 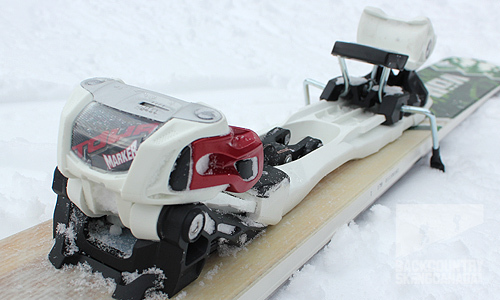 The wide binding platform enables the F12 to drive skis well over 100mm and provides a secure feel in the backcountry and on the groomers at the resort. 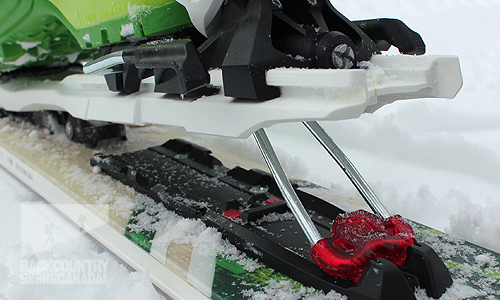 Because the mechanism to switch between ski and touring modes is neatly stowed under foot this means you have to remove your ski in order to switch over (similar to the Dukes). So no more fancy pants skin peel with skis on - this is something I did miss while testing these bindings. It is not the end of the world but it does add an extra step when transitioning and if you are in deep powder snow it can become a bit of a pain as you sink up to your hips in snow and then fuss to get back up and onto your skis. 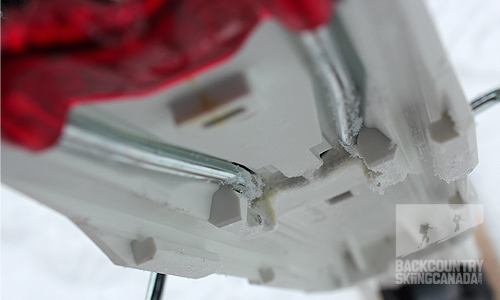 In order to switch from ski to tour mode you will need to free the binding of snow by hand and then lift up the leather loop so that you can effectively pry the locking mechanism back and release the heal. This sounds like a bit of work and it is, but like most things you get better with repeated use. 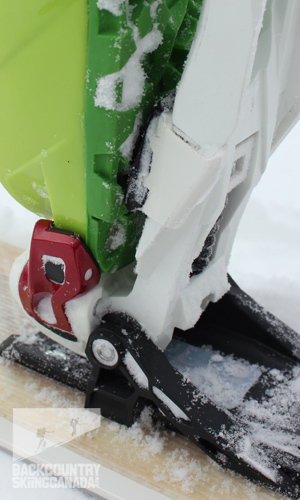 The key in transitioning from touring to skiing mode is to smack down the Tour F12 heal piece onto your ski repeatedly to remove any snow or ice build up on the underside of the binding so that it is as easy to engage as possible. Because some force is necessary to lock the heel down you will need to have a firm surface on which to push down and since you are hopefully skiing in bottomless POW you may want to use your other hand or I find my thigh works well. Once in touring mode the Marker Tour F12 Alpine Touring Binding provides a natural stride with little friction (some say this is due to the 40mm rear difference while in tour mode). 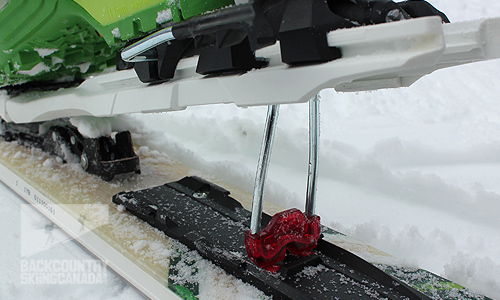 The built in climbing Aid provides 7 and 13 degrees of incline which is easily accessed with your ski pole in a natural linear downward motion. The Climbing aid uses a elastomer pad to dampen the typical touring clack (which is welcome) and also rests firmly against the base place stopper to ensure that the riser will not give way. My first question was "why not place the locking mechanism behind the heal similar to Fritschi and the new Salomon AT binding?". 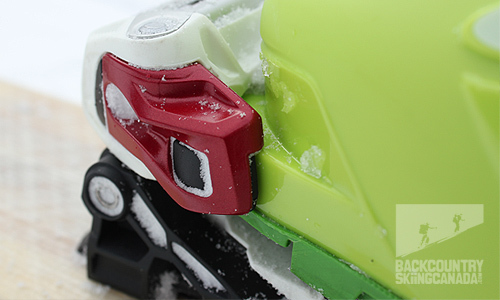 This would improve access and and allow for leaving your skis on while transitioning. After speaking with the Marker representative they told us that it was for safety as other AT bindings with the mechanism behind the heal can accidentaly switch into tour mode. With the mechanism under foot it does make for a sleeker design but some may say at the cost of usability. I think Marker has done an admirable job at integrating the locking mechanism between the toe and heal piece - not an easy feat. It does provide additional issues as mentioned above but overall you get used to the new way of doing things pretty fast. 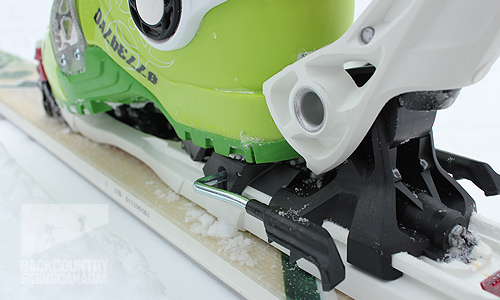 The biggest benefit I see on the Marker Tour F12 Alpine Touring Binding is that the heal locking mechanism spans the entire length of the heal piece (approximately 40 mm) which locks things together much more effectively than a Fritschi Freeride Pro does. Over my months of testing I had no ice build up in this location which was an initial concern and something that has been a design flaw on the Fritschis through their various iterations. The Marker Tour F12 Alpine Touring Binding brings a lot of its design from the ultra sturdy Marker Duke and this shows, the F12 is super beefy. No toe wiggle and a solid heal locking mechanism - one that instils confidence. The F12's are built sturdy and you can feel it in every aspect. This translates into a better ski and touring experience for this reviewer and instils confidence that these suckers will do the job they were designed to do. 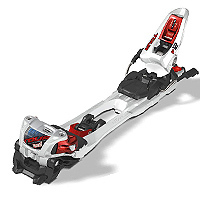 The Marker Tour F12 Alpine Touring Binding can drive a big ski without hesitation and feels almost like an alpine binding - I cannot say that for other AT bindings on the market. One item worth noting after extended use is that I found that when stepping into the binding you need to use a lot of force to assure that the binding is fully engaged - you may think you are locked in tight but a quick test and you will find some play underfoot. Avoid a surprise release by being diligent when getting into the Marker Tour F12 Alpine Touring Binding. Final verdict? 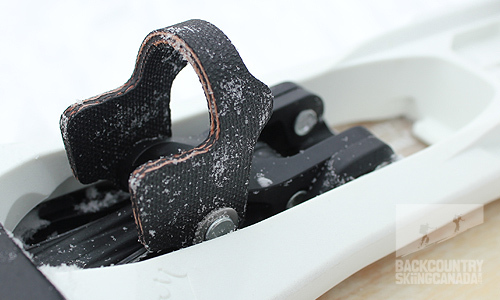 If you would like a solid AT binding that skis and tours with the confidence of an alpine binding, yet weighs less than most others on the market then this is your binding of choice. 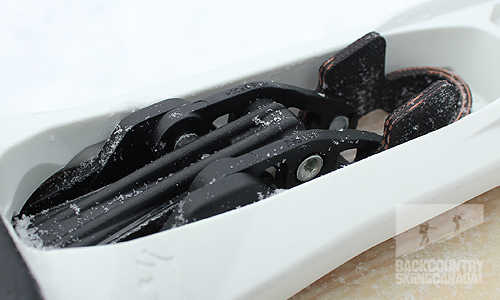 You will get used to operating the new locking mechanism and appreciate how solid and at one with the ski you are. Solid locking mechanism, good transfer of energy to the ski, confidence in your AT binding without the added weight gain you would expect. Getting used to a new way of doing things and not being able to perform a skin peel with your skis still on. 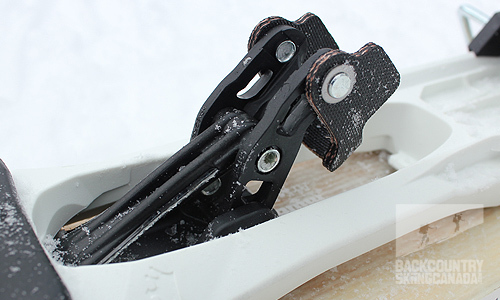 After two seasons on the Marker F12 AT Bindings I can attest to their durability and rugged design. I have over 150 days on these bindings and they are just as solid as the day I got them. I have been running them on the Volkl Nunataq skis which won our gear of the year last season. Together with the Marker F12 this is a killer resort and backcountry set up. The bindings allow me to ski the hill with confidence and then zip out of bounds for a few laps or even a full day. 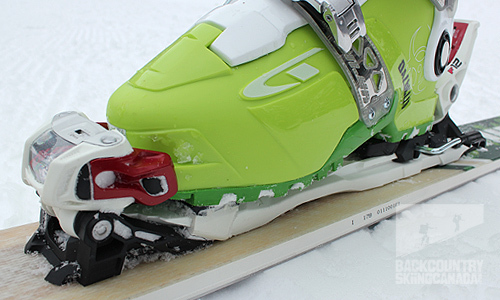 I highly recommend these bindings and we look forward to reviewing the F10's this coming season.